Highlights: The Canyon, incised by the mighty Colorado River, is immense, averaging 4,000 feet deep for its entire 277 miles. The sheer depth and magnitude of the Canyon truly makes it 'incomparable'. From the humble origins of a small fishing village known as Yerba Buena, San Francisco grew rapidly due to the California gold rush starting in 1848. Devastated by the 1906 earthquake, San Francisco was rebuilt quickly. Long enjoying a bohemian reputation, the city became a counterculture magnet in the second half of the 20th century. From Art Deco to The Grateful Dead, and the center of the dot-com boom at the end of the century, there has never been a dull moment in this picturesque city by the Bay. – Please arrange your air-ticket departure from Los Angeles (LAX) airport after 11pm. 3:30pm, Please meet Lassen Tours’ staff member at Excalibur Hotel “Lassen Tours Check-in Counter”. Las Vegas, it’s a city that has something to offer for everyone. The infamous Las Vegas Strip is where tourists can enjoy a walk in the warm desert evening and visit the newest and most lavish casinos from Bellagio, Venetian, MGM Grand, The Mirage, and others. Or perhaps take a stroll downtown and view a dazzling light show that spans an entire street (Optional night tour). The are special shows and performances year round that truly makes Las Vegas as a city that never sleeps. Accommodations will be at the Excalibur Hotel & Casino, named for the mythical sword of King Arthur. Immerse yourself in the castle themed resort right in the middle of the Las Vegas Strip. Choose from one of the many eateries on the property, including the Roundtable Buffet, or head down the Strip and stop by one of the other world famous hotels. 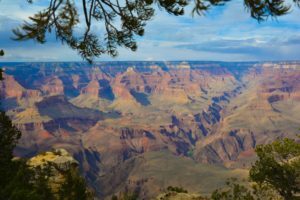 Your journey begins from stopping by the magnificent Hoover Dam and then on to the Majestic Hualapai Indian Reservation where is located at the West Rim of the Grand Canyon. You can walk along the rim of this great wonder of nature – unblemished by modern civilization. You may walk on the Skywalk (Optional tour). David Jin, the man who conceived and funded Skywalk makes this U-shaped platform, which extends 70ft over the edge and about 4,000 feet over the canyon floor. You may also elect to take a airplane ride flight into the Grand Canyon & cruise along the Colorado River aboard a pontoon boat (Optional tour). Overnight stay in Las Vegas. Discover America’s most picturesque and culturally diverse city – San Francisco. Highlights include: Civic Center, Twin Peaks, Golden Gate Park, Golden Gate Bridge, Palace of Fine Arts, Fisherman’s Wharf, Market Street and Chinatown. 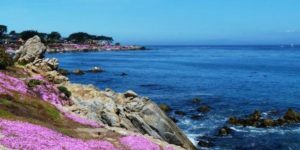 Experience the beauty of the California coastline while driving through 17 Miles Scenic Drive, views of Seal Rock, the majestic Cypress Point, Pebble Beach, Fisherman’s Wharf, and the small charming town of Carmel highlight this area. Browse along the streets of Carmel and enjoy some of the best specialty shops and art galleries that Carmel has to offer. Visit the famous Cannery Row and the Monterey Bay Aquarium. Inside the aquarium learn about the great canyon the lies right inside Monterey Bay. It is one of the deepest underwater canyons along the continental Unites States. Transfer to the largest metropolitan area in California, Los Angeles. Stop by the historical landmarks of Hollywood, as well as Hollywood Blvd., Chinese Theater and the Dolby Theater complex (which is now the permanent home for the Oscars) and the Walt Disney Concert Hall.Overnight stay in Los Angeles. At 9:00am we will depart from the hotel and drive South along the Pacific Ocean heading to sunny San Diego, the second largest city in California. We will first stop by the U.S. Naval compound in San Diego harbor. Docked at Navy Pier is the USS Midway, the longest-serving aircraft carrier in U.S. Naval history from 1945 to 1997. After lunch, we will go to Coronado Island and visit the Hotel del Coronado. This world-famous luxury hotel was built in the Wooden Victorian style in the 1800s, and has since become a National Landmark. It has been in numerous films and has hosted presidents, royal families, and leaders from around the world. Next we will move on to another National Landmark, Balboa Park. Enjoy the luscious botanical gardens and Spanish architecture lining the long promenades. After, we will visit Old Town San Diego, where you will feel as if you stepped back in time as you walk among the classic Mexican Pueblos and shops offering many Latin American souvenirs and handicrafts. In the evening we will drive back to Los Angeles along the Golden Coast; if you are lucky you may catch a sunset. We will return to the hotel by 7:30PM . Experience movie magic at it best. The studio theme park ride attractions include Shrek, Jurassic Park, The Mummy Returns, and more. There are also various performances throughout the day. Get an inside look at the movie sets and uncover the secrets of legendary films on the world-famous studio tour. After the we will transfer you out to the airport(LAX). ** Please arrange your air-ticket departure from LAX after 11pm.